According the Web Standards Project, web designers in the 1990s wasted 25% of their time devising workarounds to their code as to be viewed properly in both Netscape and Internet Explorer. Tim Berners-Lee started the push for standards and the World Wide Web Consortium (W3C) advocates for standardization between the browsers to ensure compatibility and a better experience for the designers and the end users. Founded and headed by Tim Berners-Lee, the consortium is made up of member organizations which maintain full-time staff for the purpose of working together in the development of standards for the World Wide Web. Generally Internet Technology Standards cover interoperability of systems on the internet through defining protocols, messages formats, schemas, and languages. 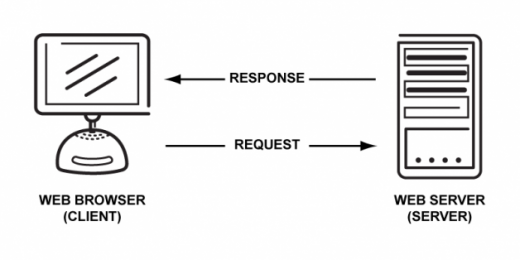 In HTTP, a web browser acts as a client while an application running on a computer hosting a web site functions as a server. The client submits an HTTP request message to the server. The server, which stores content, or provides resources, such as HTML files, or performs other functions on behalf of the client, returns a response message to the client. A Uniform Resource Identifier (URI) is a string of characters used to identify a name or a resource on the Internet. The Document Object Model (DOM) is a cross-platform and language-independent convention for representing and interacting with objects in HTML, XHTML and XML documents. Aspects of the DOM (such as its “Elements”) may be addressed and manipulated within the syntax of the programming language in use. This is text written inside an opening and closing tag. HTML is written in the form of HTML elements consisting of tags enclosed in angle brackets (like <html>) within the web page content. HTML tags normally come in pairs like <h1> and </h1>. The first tag in a pair is the start tag; the second tag is the end tag (they are also called opening tags and closing tags). In between these tags web designers can add text, tables, images, and other media. Cascading Style Sheets (CSS) describes the presentation semantics (the look and formatting) of a document written in a markup language. Its most common application is to style web pages written in HTML and XHTML, but CSS can be applied to any kind of XML document. CSS enables the separation of document content (written in HTML or a similar markup language) from document presentation, such as the layout, colors, and type. Hypertext Pre-Processor (PHP) is a general-purpose scripting language designed to produce dynamic web pages. PHP code is embedded into the HTML source document and interpreted by a web server, which generates the web page. PHP is an open-source technology and can be deployed on most web servers and as a standalone interpreter on almost every operating system and platform free of charge.